Adult Catholic religious education books range from simple to complete. Usually, adult Catholic religious education involves a class or study group; yet outside the instruction given at your parish, all an adult needs in order to learn about the faith is one good Catholic catechism. Books about some of the saints, and the Bible are helpful, too. Learning about the Faith right the first time is easy with good books. This page has classic recommendations that have stood the test of time. Catholic Religious Education courses are frequently for brand new converts or for those of us who did not receive much Catholic instruction after Baptism or First Communion. You'll find this at your parish or you can arrange this with your pastor. Normally we learn about the Faith through family and friends. Use their recommendations for where to go. Sometimes we come to learn about the Faith through our own reading and discernment. Normally we should seek the help of the local parish priest, yet today that may jeopardize your faith if you are not careful. Pray for discernment always, yet especially when choosing where you will go to church and learn about the Catholic Faith. Years ago, I remember my parents parish hopping as things were getting weird in the Church, so do seek truly Catholic priests and religious education courses if you do not have someone that can make recommendations. If you have a good priest and course, you can probably stop reading this page as you should read what Father recommends. If not, continue reading to learn the basics and see a list of good Catholic books. There are many adults who were never asked to learn the Catholic Ten Commandments. I was one of many. Even to receive Confirmation. The 10 Commandments are super basic to the study of any adult Catholic catechism for both First Communion and Confirmation, so why did I not learn them? No one had asked. I know that my second grade teacher did a good job of covering the Commandments, yet I do not remember memorizing them. It would have been so handy in high school! The Apostles' Creed, Catholic Sacraments, Catholic Prayers, and the virtues/vices are the basis of any catechism and sectioned like this is the way that the Catholic church has taught the Faith for centuries. Once you have these basics, you know most of what you need. You can even read ahead of time. There's not really an advanced religious education for adults unless you think of it in terms of continuing education. You simply prepare for and receive the sacraments. Then you obey the Commandments, the precepts of the Church. Do good and avoid evil. Beyond that is simply to grow in virtue. There are usually classes for matrimony and there are seminaries for Holy Orders; yet, again, these are for those who are preparing for those sacraments. After that, when you have time, read more good Catholic books. Good reading is a wonderful help to growing in the Faith. I suggest that you look for time tested books. For centuries bishops, priests, brothers and nuns have used the books we recommend on our site, so these would be a helpful start if you're on your own at this moment. My favorite catechism to recommend to high school students and adults is the Catechism of the Council of Trent (Amazon). It is also the most definitive. It was originally called the Roman Catechism and is the Roman Catholic Catechism on which the Baltimore Catechism is based. The section on the Our Father is worth a read every year! I am so glad that we have used this book as our catechism with our high school children. It is the catechism that most other catechisms use as a model, especially as claimed by the Baltimore. See more books on our adult catechism page here. The papal encyclicals are wonderful to read, too. They're usually short pamphlets, yet they're power packed with information and a bit of history. I like to read them in order of time since the time of Pope Pius IX so that I get an historical feel for what they were referring to as the years progressed. These are the main Popes who fought modernism, so we can learn much that helps us in today's environment. You can find most encyclicals online free from Vatican.va. Pope St. Pius X placed such a high premium on the catechism that he made a catechism long before he was made Pope. Your Missal will have plenty to study your first years as through a year it will cover most of the Bible. It's the original "Bible readings for the day" book. The Douay Rheims Bible is the definitive Catholic Bible, so it is the only one I recommend. Other versions are paraphrases. A Practical Commentary On Holy Scripture (Amazon) is the best in depth book on the Bible that I have read. I love that it incorporates Bible history, the catechism, and practical meditations. It's great for Catholic high school and homeschool. There are many adult converts in history. One of the greatest is St. Augustine. You can learn more about Catholic saints here. Young adults often are free to seek instruction on their own and the pastor can let you know when the next class is starting. Often a priest will give you things to read and schedule individual appointments for private classes. Conversion is not something to put off to a later date. You want to preserve this great grace as God may not send it again or you might find yourself distracted from the one thing necessary. 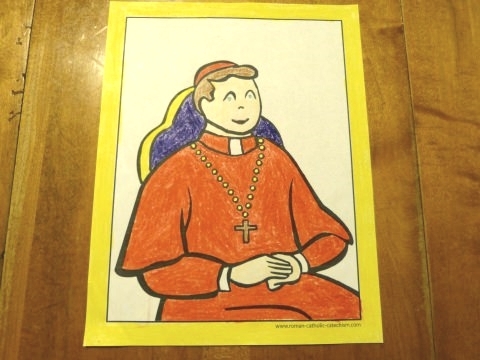 If you and your family are entering the Catholic Church, your children can learn right along with you. Sometimes the best adult Catholic religious education program happens best when we help our children learn the Catholic answers. They'll also ask great questions. Just listening to what you're reading and discussing they learn most of the answers. They'll sparkle up your study! Kids will love the many resources on our site. 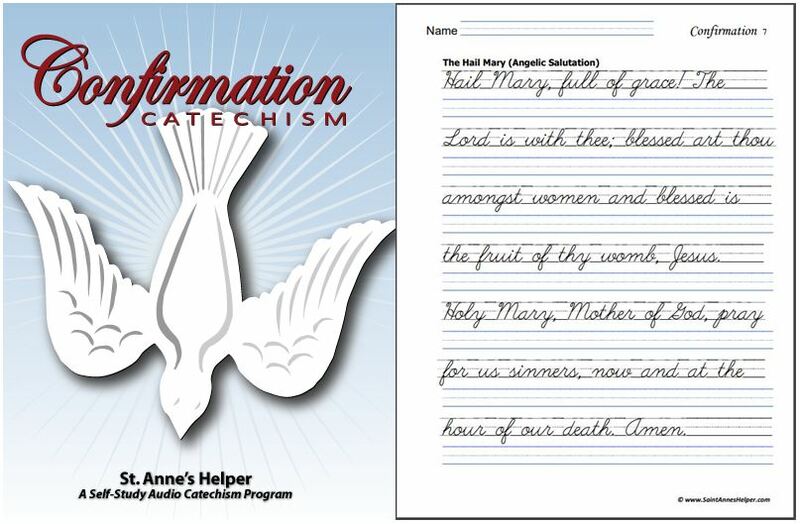 We have manuscript and cursive Catholic worksheets, or catechism copybooks, too. If you have children who are studying the Faith with you, or if they simply need good Catholic books for penmanship copywork, these are perfect. 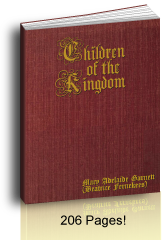 You will love the Children of The Kingdom ebook and scores of religious coloring pages. 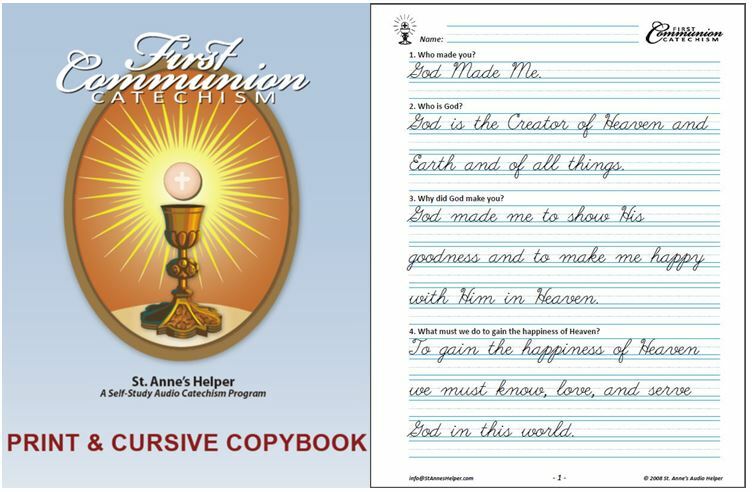 If your children are preparing to receive the sacraments with you, they will be able to use our St. Anne's Helper CDs or Downloads. The audio books are explained below. You will like them, too, especially the audio books as they cover the main questions and answers in less than one half hour's total listening time. Please understand that there is nothing difficult about becoming Catholic once your own self-will is in check. And not even that, actually, as it takes God's grace to be able to control our wills. Pray for the graces to pursue the One Thing Necessary. Becoming a Catholic is the greatest grace outside final perseverance because the promise is that you will go to Heaven if you keep the faith and die in the state of grace. By Baptism you gain the state of grace that Adam and Eve lost with Original Sin. By following what the Church teaches we preserve and increase grace by receiving the sacraments. When you fall you can regain the state of grace in confession. After your first year using a catechism, it is very helpful to read several books on Catholic spirituality and the saints lives. There is no need for vast studies or long courses. Many of us do not have time. God knows this. It's why He keeps things simple so that we can recognize right and wrong even in our day. But how do we recognize good books? Compare the material in them. Here are a few questions that I have found to be easy indicators. Red flags waving, if you will. Today, many people are so tempted to use subjective answers in an attempt at false generosity. Adult Catholic religious education classes can get crazy, yet precise definitions are the answer to the confusion. Ask this question: Does the book or catechism present the questions that define what a truth is? Once we know what the definition of Baptism IS we know what it DOES for ourselves AND for others. The difference between answering "What is Baptism?" and answering "What does Baptism do for you?" is that the definition offers the truth that can be applied in any subjective instance. It is clear and concise. This does not work in reverse, though. Once you know what Baptism does for you, you do not necessarily know the definition of Baptism, what Baptism "is", or what Baptism does for others. The difference is certitude. The same applies for "What IS Confirmation?" "What IS the Mass?" Etc. Also, it is important to remember that such truths as the Ten Commandments are not mere suggestions! They really are commands. The Commandments are God's instruction manual for eternal happiness and makes adult Catholic religious education clear and easy to understand. My mother used to say: "They're not the Ten Suggestions, you know." Oh! What a blessing to have certitude. Thank God for the Catholic religion and thank Him for being able to find a good catechism. Today many books can be very vague, so do be discerning and ask for help. See more on the Catholic Ten Commandments here. 4.B. Is Evolution Responsible For All That Exists? Is evolution a complicated question? From the catechism: "Who made you? God made me." God is creating souls every single day. From the Apostles' Creed and catechism: "God is the Creator of Heaven and earth and of all things." One of our favorite adult Catholic religious education books, The Church Teaches explains this. It says on page 141 that the Catholic Church has always taught that God created Heaven and earth in the earliest studies of the Faith, because "the true concept of creation excludes every form of emanationism and pantheism". Certitude! There can be no macro evolution of gasses to monkeys to human beings. God made each one of us. This is the very first line in the Bible : "In the beginning God created heaven, and earth..." Gen 1:1. The Catechism of the Council of Trent (it's easy to read!) teaches it this way as does The Catechism Explained. They teach the many truths that we can know about Him based on this truth. Some Baltimore Catechism versions answer that God is the Supreme Being. Of course. He created all things. Check to see, though, if the explicit teaching of God's act of creating is omitted though, before you buy the book. Look for a version that includes this truth as with some Baltimore Catechisms from the 1950s and earlier. 4.C. Is Corporate Conscience A Religious Reality? "Confession is the telling of my sins to a priest to have them forgiven." I "examine my conscience", I am "sorry for my sins", I "make up my mind not to sin again", etc. It is important to learn, or to teach, the singular version of penance and confession answers in adult Catholic religious education. Yes, many questions can be answered in the possessive plural: "we" do confess "our" sins to a priest; yet if the singular is not taught there is room for the errors of corporate conscience. "We" (plural) do not have "a" (singular) conscience. Catholic confession is a singular matter. Many pastors must ask their parishioners to teach their children not to confess the sins of others. The varying catechisms are part of the reason. Beware this wording when you buy religious education books. See Catholic Penance for more on the sacrament of Penance and making your confession. You can read more red flags waving here. If you will soon be baptized or confirmed, you'll want to be familiar with the Roman Catholic saints names. Catholic names are a major consideration in adult Catholic religious education when studying for the sacraments of Baptism and Confirmation since traditionally we choose a patron saint for each. It is best to read stories about the saints in order to choose a saint that is known to help with the virtues you need or want. Learn more about the Catholic Saints here. Learn about choosing a name here. Another idea is to see a Catholic liturgical calendar for the dates of Catholic feast days and lists of patron saints. You can choose the name of a saint near your Baptismal or Confirmation date, or your birthday. A calendar is excellent for tracking the Catholic Holy Days of Obligation through the year (see our great holy day chart as well). In Confirmation class you'll learn that Catholic holidays are either Holy Days of Obligation or Catholic feast days. By the time you are ready for Confirmation you will know all six Holy Days of Obligation, so as to better remember their obligation during the year. Just in case, would you like to sign up for a Catholic Holy Days Of Obligation Reminder? 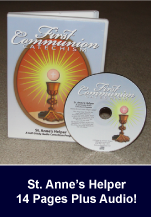 The basics are super simple, so if you are looking for adult Catholic religious education texts that are concise and easy to memorize, ﻿try St. Anne's Helper's Audio book. It has the basic Catholic beliefs as found in most any Catholic catechism. These were developed precisely for ease of use. They use an enhanced CD﻿ format that includes both the printable text and the audio files. 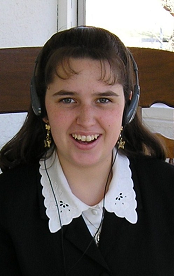 The audio CDs can be used in the car or while doing light chores. They can serve as a cursory review or be used in a rigorous manner so as to be able to review, review, review! 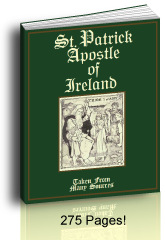 Volume 1 covers the usual questions and answers for Baptism and the Holy Eucharist. The First Communion preparation covers the basics for Baptism, Penance (Ten Commandments and their "tells and forbids" - What does the Fifth Commandment tell as well as forbid? ), the Mass and the receiving of Holy Communion, and the Catholic prayers. See them on our order page. Volume 2 covers the usual questions and answers for Confirmation. Again, it is easy to listen to them for casual study or to review for a written quiz; and again, the text is included so there is no need to buy another booklet. If several of your family are studying you can copy the text for each candidate. 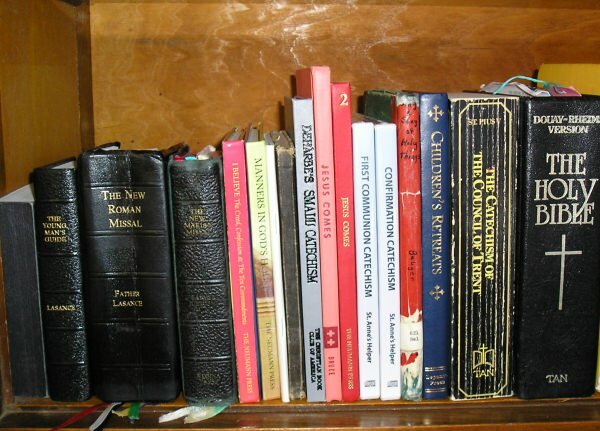 Adults would want to use both the First Communion and the Confirmation Audio Catechisms (CDs or Downloads) so as to cover the basics of all seven sacraments. 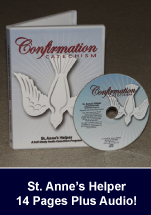 The Confirmation preparation offers the definitions of all seven sacraments and a deeper study about the Blessed Trinity with an emphasis on the Holy Ghost and the graces received in Confirmation.